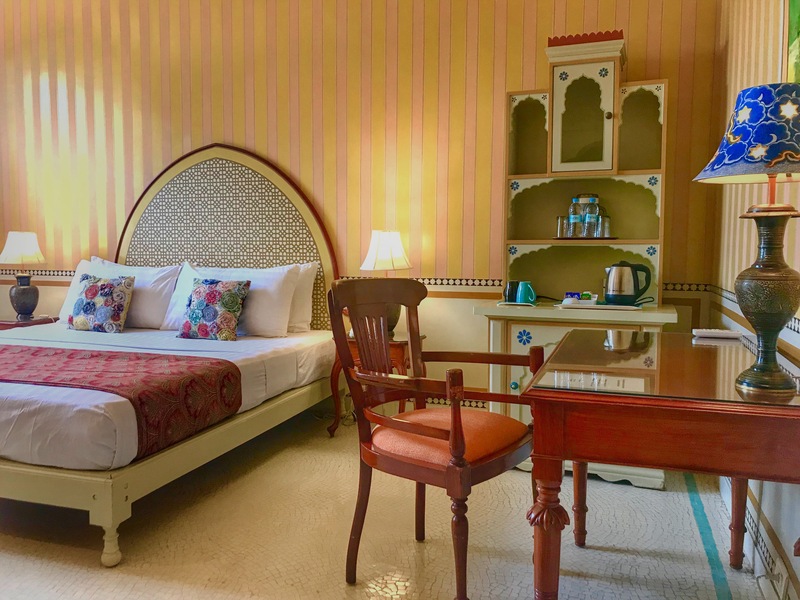 Gaj Kesri an upscale royal themed resort on the outskirts of Bikaner in Rajasthan is the perfect place to get away for a holiday filled with luxury. Flying into Bikaner’s tiny airport is quite an experience. Well for one this is a small defense airport that has limited connectivity and your luggage is actually physically handed over to you. The desert city of Bikaner however, is beautiful dotted with heritage buildings called havelis that are an ode to its rich royal legacy. Located at a distance of roughly 30 minutes from the airport was my destination – Gaj Kesri, a resort spread over 30 acres off the city limits. The brainchild of owner Sunil Rampuria who has designed the place, the resort has 41 well-appointed rooms. The design of the resort resembles a palatial home and all the artefacts are made in house. A long driveway flanked by colourful lawns with hollyhock plants lead you to the resort’s main entrance. Make your way past the lobby and you are greeted by a bright courtyard that is open to the sky. The resort is extensively furnished with local handicrafts all of which have been personally approved by Sunil. Being a passionate hotelier (he also owns the well-known Bhanwar Niwas in town), Sunil took a little over three years to execute his designs into action as far as Gaj Kesri is concerned and naturally the resort is a labour of love. 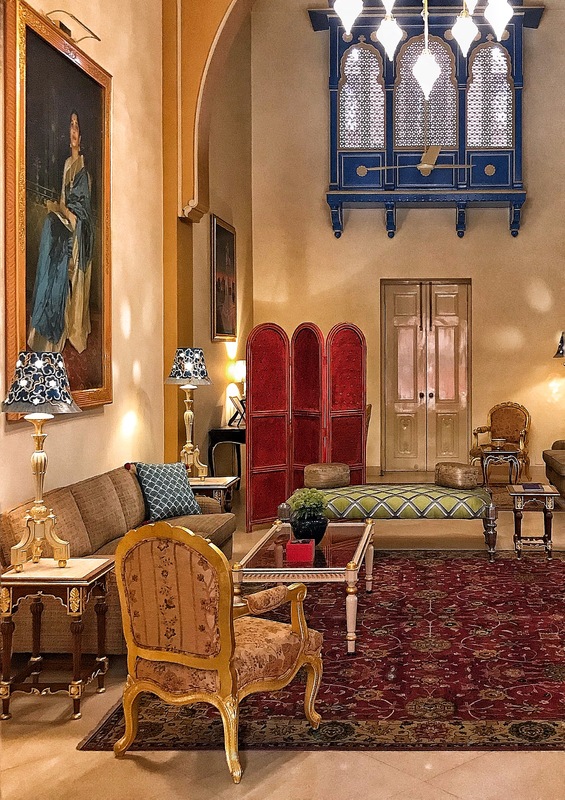 “I was the designer, architect, builder and eventually the hotelier all rolled into one and art being part of my genes, I never compromised even once when building this hotel,” says Sunil. 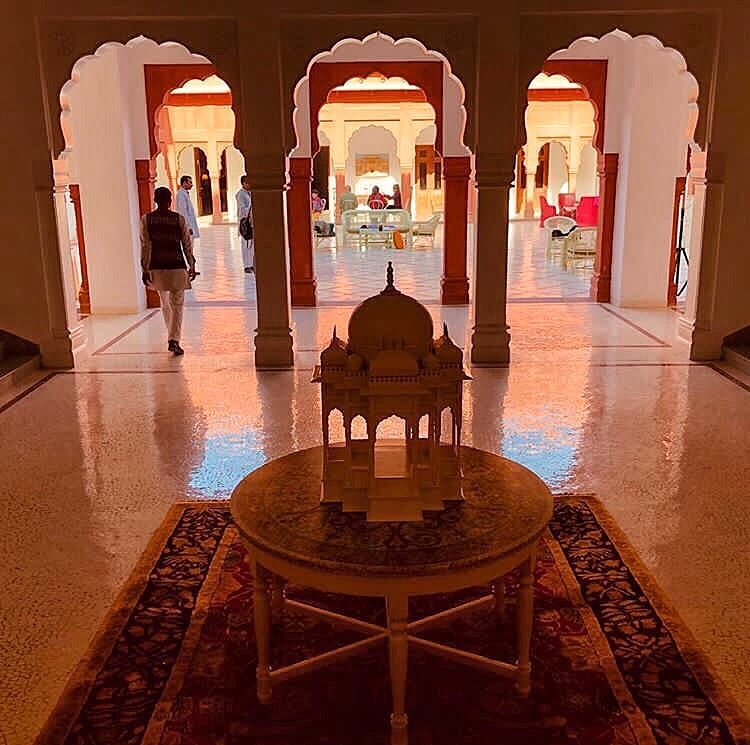 With beautiful arches, carved pillars and artefacts that blend into a natural landscape the resort offers a getaway that is both tranquil and peaceful. Each of the rooms are also done up using several local influences in terms of the art and furnishings used and has hand painted walls. The ten garden suites are done up in a more contemporary manner using more of the European décor sensibilities. These rooms are larger and have plain walls and have fewer artefacts. The resort is set on five levels and is expansive that makes it spacious and yet peaceful as a location. 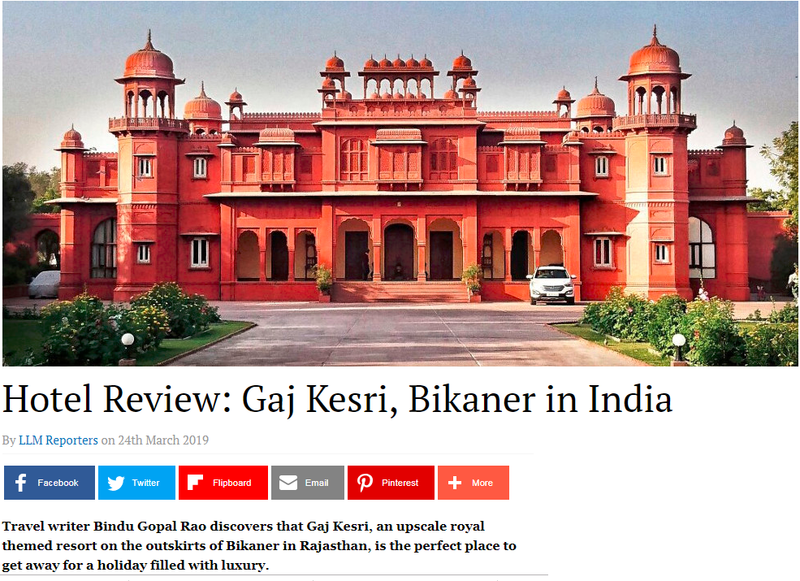 Gaj Kesri is home to a superb and unparalleled collection of contemporary Usta Work which is the glorious art form of Bikaner which is all created in their own workshop at Bhanwar Niwas. That makes the hotel a museum of sorts. Sunil has been passionately involved for the last 35 years in keeping this lovely art form alive and nothing will give you more pleasure than seeing the masterpieces created by the brothers Asghar, Iqbal, Ayyub and Ameen (all third generation artists) adorning the spaces inside the main building. This art would be done on camel leather earlier and today it is being done on other materials as well. Interestingly Usta is an art form that comprises different techniques including gold embossing work. There are three drawing rooms in the property The Big Drawing Room, the T Drawing Room that has a T shape and a lovely portrait of Tara Rampuria (Sunil’s mother) that dominates the room and the Little Drawing Room. All these rooms are furnished with beautiful teak wood furniture and local artefacts and serve as a great window to the culture of the city. Designed as spaces for guests to relax, these living rooms are architecturally delightful. Art is everywhere in the property and special mention must be made of the 3D models on the walls as well as the ceramic tiled flooring in the courtyard. Even the chandeliers here have been designed by Sunil, who drew the design, got the die cast and brought them to life by the artists. The restaurant at Gaj Kesri serves fantastic local vegetarian fare and gives you a great insight into Indian, Chinese and Continental fare. When here do try the special Rajasthani thaali which will give you a taste of the local food. For special occasions the restaurant also sets up a table on the pool side and this makes for a special meal. 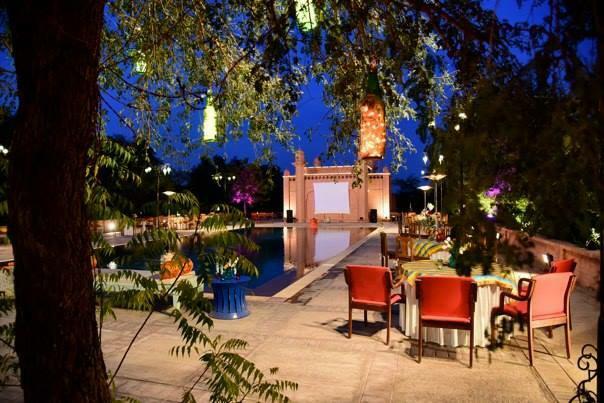 Since Bikaner has sand dunes, the resort can also arrange for special dinner on the dunes on request. The property is located outside the city limits and has a large swimming pool on the premises. There is a local music band that plays music every day in the evening. The resort also organizes kite flying activity and you could also be part of local festivals like Holi. The resort also has camel rides and camel cart rides that can be organized with a day’s notice. A spa, gym and a souvenir store is on the cards to be open soon. While in Bikaner, you must visit the Junagarh Fort, Havelis in the walled city, The Lalgarh Palace and Museum, Jain Temples, markets and bazaars, mithai and namkeen shops, Devi Kund Sagar royal cenotaphs, The Camel Research Centre, The State Archives, The Ganga Golden Jubilee Museum and the Karni Mata Temple at Deshnoke among other important sites. The city is famed for its snacks and it makes for a great food souvenir to take back home. An experience at Gaj Kesri is all about living the royal life and it is the friendly staff that makes for a memorable stay. Bikaner has an airport that has flight connectivity from Jaipur and Delhi currently that has made the destination more accessible. For me it was Sunil’s passion that came through clearly during my stay here which is what made the difference to the overall experience.